Because of its volume you will have to cut its pattern parts WITHOUT any seam allowance. The doubled layer of the seam allowance would really be too much volume. So how to connect the coupe seam in the upper cup to the lower cup? 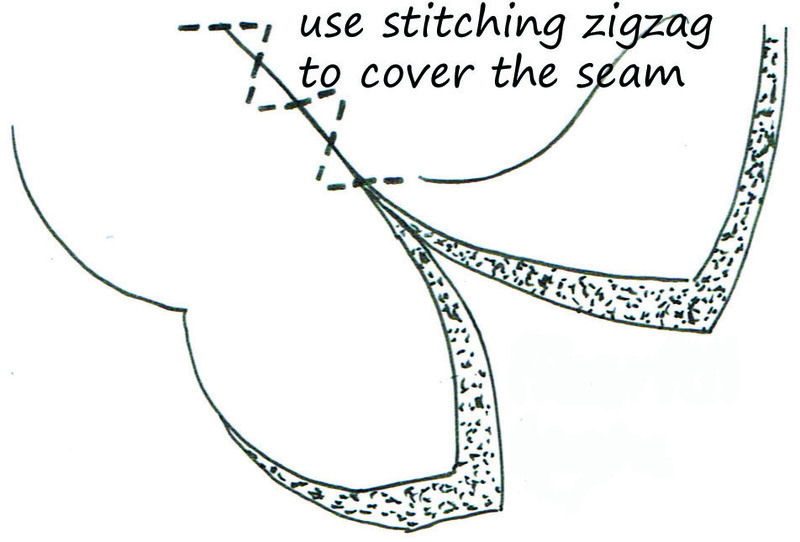 Simple, by using the stitching zigzag as shown in the picture below. The zig and the zag are formed by 3 stitches each instead of just one stitch to the left and one stitch to the right. Make sure to push the foam seams together a bit while stitching so the zigzag is covering the seam without gaps. The lycra cup parts and the lining cup parts are sewn separately. Just sew their upper cup and lower cup together with a straight stitch. 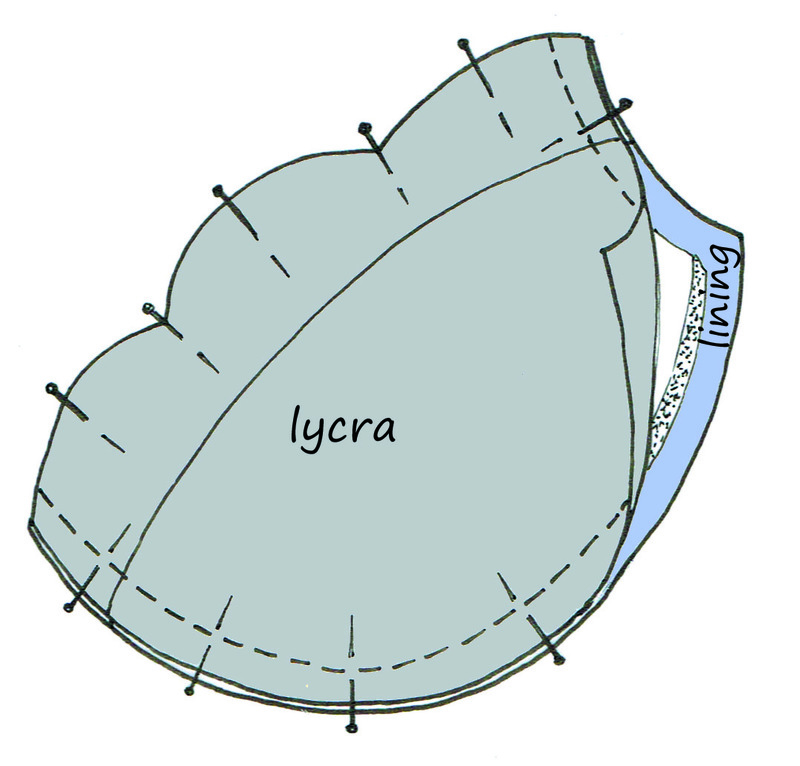 Then pin the lycra cup with the right side on the right side of the lining cup. Check before stitching; the seam allowances must be visible at both sides! Next pin the foam cup on the lycra; this one has no seam allowance so the lycra and lining are sticking out all around the foam. Now stitch the top edge (curved or not) with a straight stitch. The machine will flatten the foam a bit and some stitches will slide through the foam as well. This way it will be just fastened enough. The picture shows some small insert cuts which are only needed when the top edge is curved. Next step is folding the lining back over the foam cup. Secure the top edge with a row of pins; this needs some of your attention to get a smooth top edge. Then fold the lower cup of lining back over the upper cup. In the picture I used sheer lining to still show some of the upper cup for orientation. Carefully pin the coupe seam allowance on the zigzag stitched coupe seam of the foam. Don’t forget the foam has no seam allowances so the lining must stick out at both sides! Make sure the lycra cup is folded away and doesn’t get pinned as well. Stitch the lining (not the lycra!) on the foam filling just beside the earlier stitching. This will keep the lining tight against the foam and avoid the lining from wrinkling and floating inside the bra. It’s a bit difficult to keep all 3 layers together all the time when adding the bra band, they might start moving around during stitching. 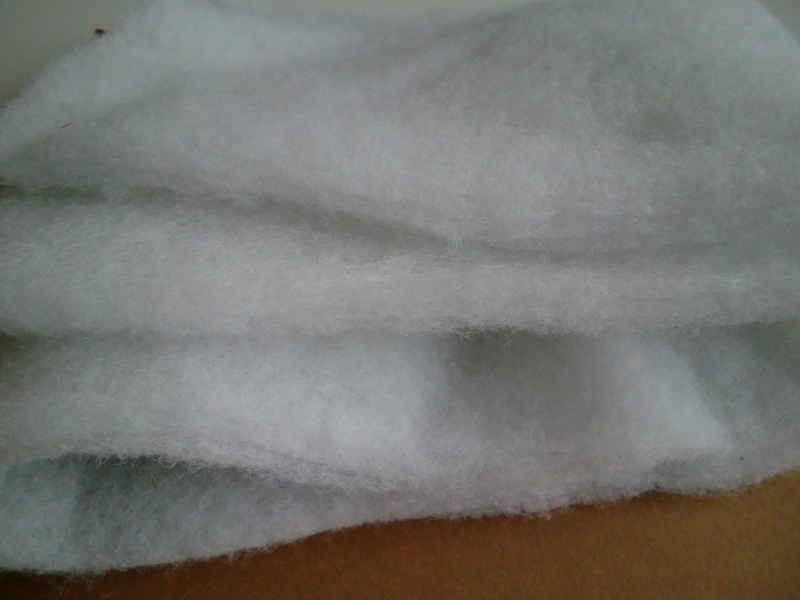 This is easy to avoid; smoothly fold the lycra and lining over the foam filling and pin all around the edges. Try to stretch the foam a little bit so it will be stitched along as in the top edge. Secure the edges with a straight stitch at 0,75cm from the raw edge so it will not show after the bra is completed. The bra cups are now ready to sew into the bra band. You might have noticed the pins are all in transverse to the seams and edges during the whole process. This is a little sewing trick to keep the layers in place during stitching since stretch fabrics can be quite slippery. When pinned along with the seams the fabrics tend to slide away from each other. In this aspect sewing stretch fabrics is very different from working with woven fabrics. In case you consider to give this a try, keep in mind you might need to choose the bra cups a whole size larger due to the thickness of the foam. For my own bras I usually choose this option because the super softness of the cups against my skin give me a very luxurious feel. For the upper cups I always split the thickness of the foam in half to avoid the top edge standing out. 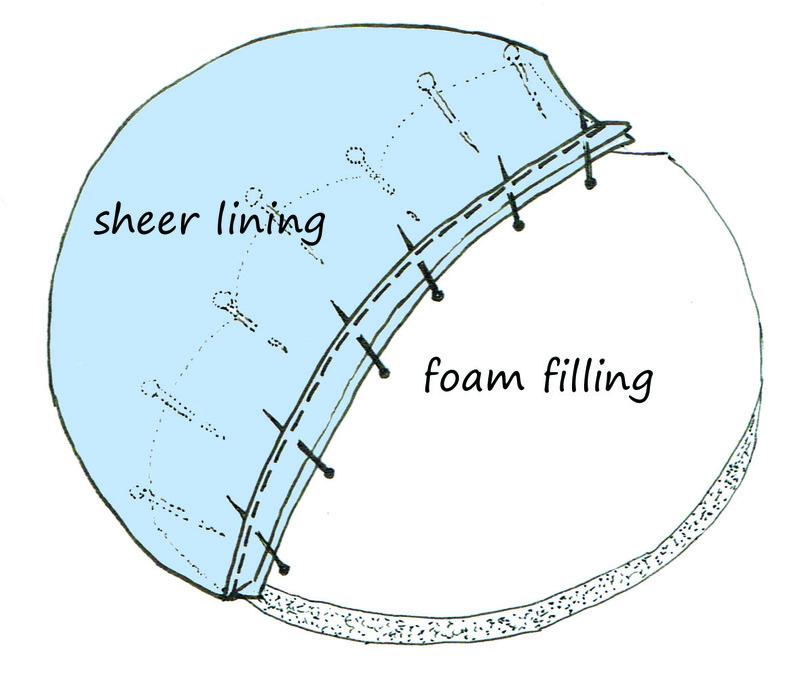 Hopefully this illustrated step-by-step description helped to clarify the process of adding this type of foam filling for you all. This entry was posted in tips and tricks and tagged adjusting, bra, bra cup, bra cups, bra pattern, choose, communicate, design, DIY, fabric cutting, foam filling, illustrated, lingerie, lycra, make a bra, scallops, sewing, stitching zigzag, transverse pinning, understanding, underwear, volume cups. Bookmark the permalink. The paper pattern PBH30 for this bra is not the same as the download PUSHUP bra when it comes to the foam filling. The paper pattern has not the same integrated foam filling but instead describes a removable foam pad. 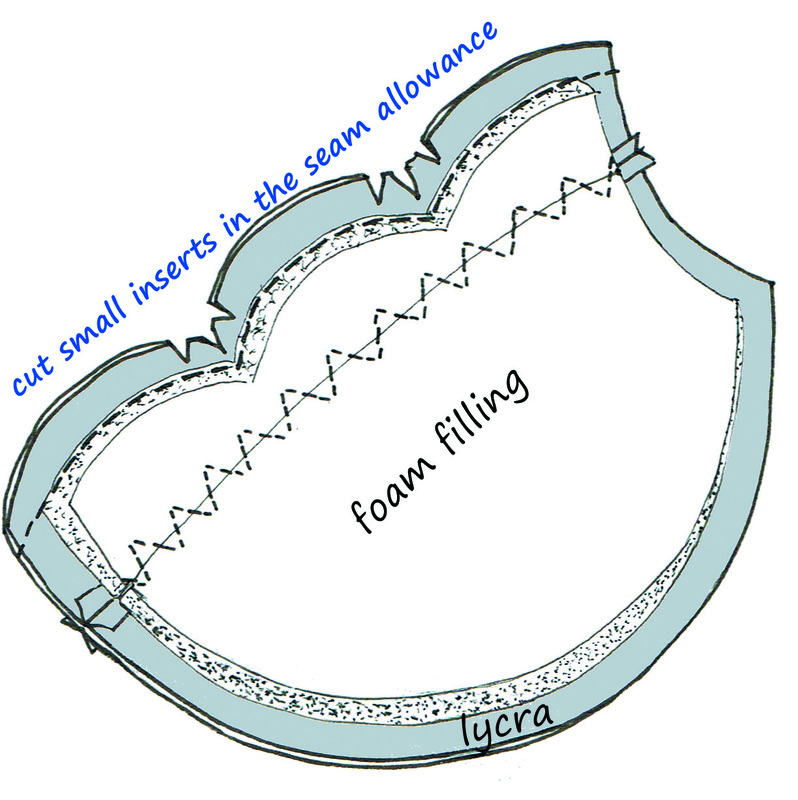 For the download bra pattern PUSHUP I’ve used this integrated foam filling.